Ancient Egyptian royal tomb. Illustration of the interior of a royal tomb of a pharaoh of Ancient Egypt. This depiction is partially based on the tomb of Thutmose III, the sixth Pharaoh of the Eighteenth Dynasty. Thutmose III ruled from 1479 BC to 1425 BC. The tomb has many rooms and side room, with the tomb at lower right. 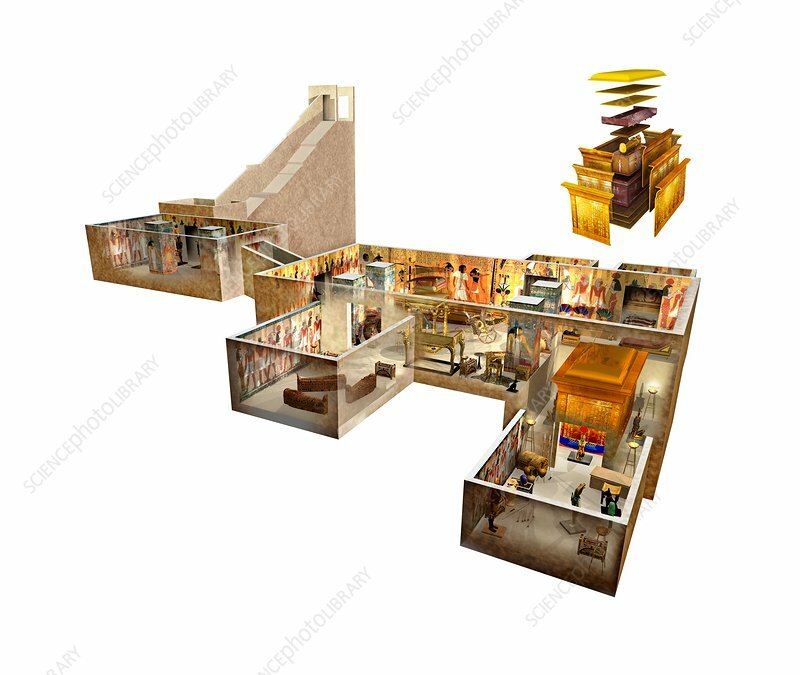 An exploded view of the burial site is at upper right, including the sarcophagus inside it that contains the mummified body of the pharaoh. Thutmose III's tomb (KV34) was discovered in the Valley of the Kings in 1898 by French Egyptologist Victor Loret. The tomb shown here is adorned with wall paintings and carvings, and ornate funerary objects and statues, along with sarcophagi of family members.